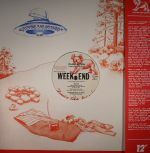 Review: Originally written by Leroy Burgess and James Calloway for Patrick Adams' Phreek, iconic NYC disco boogie gem "The Weekend" enjoyed a Class Action re-up in 1983 with two bonafide mixing titans at the controls; M&M and Larry Levan. The former was all about the big synth gloss and a really broad groove while Levan gave it a serious DJ twist with a two minute intro that really broken down each element. Party time.